Did you ever shop at a Woolworth’s Canada? 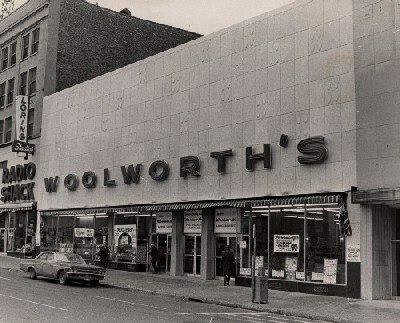 How many of you got to shop at a Woolworth’s? Might as well ask how old are ya haha! Yep we use to have one here and we use to go every few weeks. Even ate at the diner inside. I grew up on army bases so there were never any Woolworths around us. There was a Woolco’s in Barrie years ago that we would go to. Were woolworths and woolco the same thing??? What’s the diff between Woolworth’s vs. Woolco?? Foot Locker was once know as F.W. Woolworth Co. It’s essentially the same company. We had 4 Woolworth’s stores here in Vancouver,even an S.S.Kresge’s in the metro area.I used to eat lunch at there cafeteria,loved looking at the budgies and getting in on they’re bargains.Remember the striped baskets, they had to carry your goodies.Halloween was a big deal at Woolworth’s and us teens even would have our picture taken in the photo booth,or weight ourselves on the big scale outside the store.My mom and aunt shopped there in the forties,so we all miss them very much. While I remember these stores, I’ve never shopped in one. However, I do remember having shopped at a familiar sounding, but unrelated chain called “Woodward’s”. We had Woolworths in Calgary! Somewhere in old pictures, there is an image of my mother and me when I was about 3 yrs old, outside the Woolworths that used to be on the Stephen Avenue (AKA 8th Ave) Mall. Not a flattering picture, I must say! I had obviously pulled some kind of public and unacceptable toddler tantrum just outside the Woolworths, and mom was NOT impressed to say the least. I had clearly ticked my mother off to the point where she was very angry with me, so I got a couple of smacks on my bottom for my trouble. Mom then took me by the hand in order to (by now) grumpily continue with her shopping, all the while I was bawling crankily, but firmly in tow. It was at that inopportune moment a street photographer working out of Woolworths snapped our picture! According to mom, the photographer then smartly told her (with a smirk on his lips & a devilish spark in his eyes) for a nominal fee, inside Woolworths she could purchase the ‘charming memento’ of our shopping experience! Long story short, mom bought the picture (complete with its cardboard book style frame). Years later as a very young teen, I stumbled across it in mom’s stash of family pictures. Mortified by the old black & white picture, I asked her why & how on earth there was such a horrid picture of us. She grinned widely and chuckled happily as she related the entire story. I live in Vancouver, was not around back then, and I love the picture you posted and was wondering where you found it and if you have some more old pictures of Vancouver. I can remember going there with my Mom to the one in Ottawa and that was a treat as we lived in the country. I believe Woolworths was known as a “five & dime” store.. They also had a restaurant in the store where you could get a good, quick lunch. It was a bar style restaurant (a long line of stools). You really have brought up some good memories Boo! My mother was a waitress for 12 years at the Woolworth cafeteria, downtown Montreal. My brother & I would take a bus from our house (east Montreal) to visit Mom at work every once in a while, when she would say we could. It was a special treat for us. I always had a slice of their famous German Chocolate Cake, & then she’d bring us around the store to say hello to all her friends. Every once in a while I hear someone mention Woolworth’s, and I get a warm feeling inside because I love those memories! Yes my mother works here also she was a supervisor it’s a counter it will work we would stop and shop there back in the sixties I bought my holes Easter outfits are I paid no more than $20 for the dress shoes and my head that was in 1965 haha wish it was still open. I fondly remember the one we had here in Ottawa. As a child my mom would take me for Saturday lunches at the little diner inside, after spend time looking at the wares. I believe ours close in the late 80, early 90s. Its now where Chapters is on Rideau Street. Bought my first make-up at Woolworth’s and Love’s Baby Soft “perfume”. Growing up in Victoria, BC it was a real treat to go to Woolworth’s once a week with my visiting British grandparents for dinner. Fond memories, indeed. Wow, Boo is alive! Nice to know! Sure, used to shop there in the ’60s and early ’70s, but more often across the street at Kresge’s – much better store! They were in the downtown of our city. When we got a mall, there was a Woolco, which later became a WalMart. Natalka, do you remember what year Kresge’s closed? I loved the lunch counter. Yes I did when I went to summer camp with neighbors .Thought it was such a big deal to sit in a booth in the store and get silly pictures taken with my friend. Also it was the first time I had used an escalator. I remember going to Woolwthorth’s in Peterborough with my grandmother. We would always get french fries at the food counter. I miss that store and K-mart. I believe that was store # 1493. My father had a single truck that delivered to all the Toronto Stores in the lat 60’s. When I was old enough I worked for my dad delivering to stores and when Woolco moved up to Canada we started buy Tractor Trailors. We work with Woolworths for almost 20 years. It is still a great part of my memory’s. Yes, my mom & I would shop at the Woolworth’s on Columbia Street in New Westminster, BC when I was little. I remember Saturdays as a kid going to Woolworth’s on Dundas & Keele area. I remember the creaky floors & the best getting a burger & chocolate milk shake at the diner. I loved going. We used to shop at the location in Collingwood, ON. The last Woolworth’s in Vancouver was on Hastings St,next to Woodards,it closed around 1983.A building that housed Woolworth’s back in the forties and fifties in now Dressew,a fabric store.The inside hasn’t been altered,it even still has the original stairway,that led to the lower level.The Other Woolworth’s on Main st .was in my neighborhood and was a Bargain Store after,and is now a Antique store…. I shopped at Woolworth’s in Calgary on the 8th Ave mall location. It was the first time as a young girl that I was allowed to go downtown with friends. I always found it exciting to shop with friends….until one day I realized the girl I was with was stealing make-up. That made me mad that she implicated me and I never went shopping with her again, I was scared I’d get in trouble. The food counter was always exciting, so much activity but people seemed to enjoy themselves so much more than they do now. I’ve really enjoyed reading these comments…Jane, you brought tears to my eyes. Good tears. Good memories too. Thanks for sharing, everyone! That was the place to go on a Saturday! Not often did we have much more than second hand clothes, but when we did it was from the Woolworth’s along Queen Street West, just east of Bathurst St in T.O. The diner counter was a thrill beyond imagination really, spinning on those silly stools waiting to share a sandwich. Why we thought THAT was living the life I can’t explain?? Then that cheesy photo booth!! How many quarters ( yes 25 cents) did I spend mugging with my sister and later girlfriends for four B & W pics on a strip? I can still remember the blind guy standing just outside the front door, selling pens he had in a cup. We had a Woolorth’s here in Belleville On for many years. My mom(Hazel) worked there for 12 years and at SS Kreskies before that. Loved that lunch counter and the old hardwood floors. I worked there for a few weeks after school hours but it wasn’t my idea of a fun time.Haha. I loved the Woolworth’s we had on Rideau Street!!! I was so sad when it closed down exactly 20 years ago this year (1993). We used to go there all the time … the staff was so friendly and they always had great sales!!! I grow up in the junction in toronto. IN THE 50, and 1960ties I spent many hours shopping at the store at keele and Dundas. IN THE MIDDLE OF THE STORE THERE WAS Aa large ramp that could be used to slide stock down the ramp to the basement. Many times the old Manager Mr Smith would let my friends and slide down that ramp. Later I worked for Woolworths at the Head Office for over 33 years until it was sold to Walmart. I miss the people and the old building I spent so my years at. Woolworth was A good place to shop and work. My grand-father retired as V.P of woolworth and woolco canada and he lately passed away. I was a little toddler and I remember passing some time in theese stores as my earlyest memories in life. I worked in many Woolworth Stores as a Trainee! Fairview Plaza Saint John NB, Charlotte St. Saint John NB, Clarenville NF, Sidney NS and New Waterford NS. I learned so much & worked with great people along the way. I have many happy memories of Woolworth’s on 8th Ave.SW in downtown Calgary, just west of the Bay store. Whenever my mom and I went downtown, we always went into Woolworth’s and ate lunch there. They had great merchandise in those days (sixties and seventies) too. Last time I was there I bought a number of stationery items during the Woolworth’s close-out sale (60% off!) in early 1994. I also miss Kresge’s in Chinook Centre (I believe the Gap went into that space around 1991). I was wondering if anyone remembered the little cupcake like creations with coconut that had been served in some woolworths? They were delicious and a favourite treat of mine as a child. I have never been able to find a recipe. Started my working career at Woolworths in Glace Bay, NS worked in Charlottetown, PEI, Halifax, NS, Labrador City, NL, St Johns, NL, Sydney Mines, NS then back to St Johns, Nl. Ten years in total, enjoyed every minute and met a lot of wonderful people. Great company to work for. As an Australian who landed in Collingwood, Ontario for 12 months and who, needing groceries, went to Woolworths ( that is where I got my groceries in Aus.) found it very frustrating. It was a hard day as it was snowing and freezing and I had no transport ,this added to by jet lag. Was probably a bit rude to the lovely (English) lady who informed me that I needed to go elsewhere for food. However, did shop at Woolworths Collingwood for other things that we needed for our survival for the year. Loved Collingwood. Worked @ Woolworths 4 many years in Camrose Alberta. Miss those times. I was born in the Junction. I spent the majority of my youth and Saturdays shopping and having lunch at the diner inside the Woolworth store at Dundas and Keele street in Toronto. When I started my working career I was offred a job working at the Woolworth Head office at Bay and Adelaide in downtown Toronto After many years in the Woolworth decision I was transfered to the Woolco decision in 1975. I worked at Woolworth for a total of 33 years. It was a great place to work and shop. In the 1950s the Woolworth stores started to boom in popularity. Through out the 1960s when the larger department store Woolco took hold in Canada its apeal grow. Unfortunitly the decline of the two decisions Woolworth and Woolco starting in the 1990 was swift and by the year 1994 Woolworth and Woolcos life in Canada ended.I was assigned along with others to oversee the sale that remained of the Woolco decision to Walmart. In the year 2000 what remained of the employees of Woolworth and Woolco were terminated. For me it was a very sad ending to a long association with the Woolworth and Woolco name. Not much remains now on the large retail store seen in Canada. That is a shame. But if you were lucking enough to shop in one of the Woolworth store of the days past. It is a memory I am sure you now Charish. I grew up in New Glasgow, NS where there was a Woolworth’s store ,complete with a great lunch counter , on the main street .It was the “go to ” place for teens to shop. Don’t forget the 25 cent green turtles, or the candy apples!